In April 2019, Disney announced that Mickey & Minnie's Runaway Railway, already under construction at Disney's Hollywood Studios at Walt Disney World, would open at Mickey's Toontown in Disneyland in 2022. 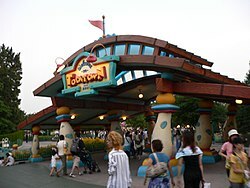 The attraction, which is expected to replace the Gag Factory store, will be the first new attraction added to Mickey's Toontown since Roger Rabbit's Car Toon Spin opened in 1994. ^ Ramirez, Michael. "Mickey & Minnie's Runaway Railway to Roll into Disneyland Park". 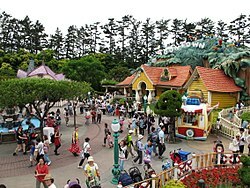 Disney Parks Blog. Retrieved April 20, 2019. ^ MacDonald, Brady. 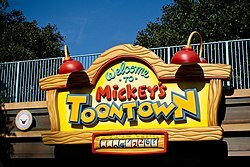 "First Mickey Mouse ride heading to Disneyland's Toontown in 2022". The Orange County Register. Retrieved April 20, 2019. ^ "Chip 'n Dale Treehouse". Disneyland website. Walt Disney Company. Retrieved August 18, 2016. 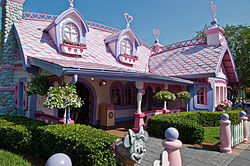 ^ "Mickey's House and Meet Mickey". Disneyland website. Walt Disney Company. Retrieved August 18, 2016. 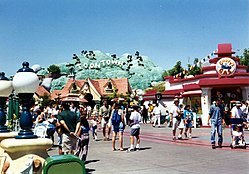 ^ a b "Gag Factory - Toontown Five & Dime". Disneyland website. Walt Disney Company. Retrieved August 18, 2016.